My beloved Washington Nationals are sitting at .500 (46-46) at the all-star break. This wasn’t supposed to be their year, so my pleasure at this better-than-expected record may well prove to be fool’s gold. This is a team that aspires to greatness someday, well in the future. The futility of the present is symbolized by Racing President Teddy Roosevelt, always grinning, always losing. As a writer, I invent happy endings that may never happen. The other night, Jayson Werth, the team’s most expensive free agent acquisition to date, had a chance to become a hero and turn his disappointing season around. He’s a perfect character for such a story. Despite a horrendous batting slump, he carries himself like a team leader, a confident athlete who understands the ups and downs of baseball, and an all-around cool dude. It was all set up for him to break out in a big way in the bottom of the ninth inning. The Nats were down by one run, with the tying and winning runs on base. Boos were raining down on him. I just knew he was about to silence those boos and win the game. He’d done it often enough in the past, when he was the opposition. How could such a perfect scenario fail to materialize? If I were writing this story, Jayson Werth would have blasted the ball to kingdom come instead of grounding into the typical double play. He would go on earning his huge salary from that night on, which nobody would begrudge him, since he would be propelling the Nats toward their first winning season. 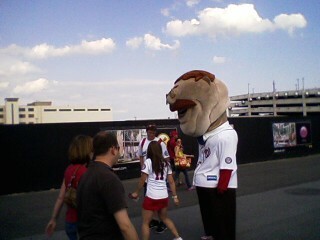 And incidentally, Teddy’s losing streak would end, since it would no longer be a suitable metaphor. I guess I’ll keep on dreaming, until reality provides a better alternative than my dreams.